This is the star of the popular Selman Bat Watches hosted by the Oklahoma Department of Wildlife Conservation. Check out the Bats and Bluffs Loop on the Great Plains Trail of Oklahoma. 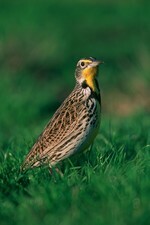 A very visible and common prairie bird using the drier areas of the prairie, the Western Meadowlark's song can be heard a long way off on a calm day in the Spring. For most Oklahomans, a true sign that Spring has arrived is the return of the Scissor-tailed Flycatcher. Oklahoma's State Bird is a Neotropical Migrant which means it spends the winter in Central and South America and breeds in North America. "Scissortails" typically perch in the open, where their long, forked tails make an unmistakeable silhouette. The tail proves useful as they expertly catch insects on the wing with sharp midair twists and turns. This flycatcher can be found all over the Great Plains Trail. Once present in large numbers, the Lesser Prairie Chicken population and original distribution has declined significantly since 1800. The decline of suitable habitat has occurred due to conversion of native rangelands to cropland, excessive grazing of remaining native rangelands, herbicide use, and severe drought. Lesser Prairie Chickens can be found on the Bats and Bluffs Loop, the Playa Lakes Loop and the High Plains Loop. One of the best places to hear Strecker’s Chorus frog is at the Salt Plains Loop and the Hackberry Flat Loop. Gliding and dipping just above the winter vegetation is the Northern Harrier, formerly known as the Marsh Hawk. Found all over Oklahoma in winter, it has been confirmed breeding in the Oklahoma panhandle. 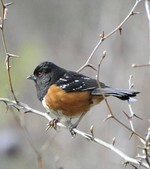 They are most likely to be noticed by the V-shaped wing posture and white rump. Hunting rodents and small birds, they rely on hearing as well as visual cues to capture prey. 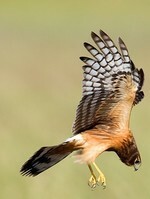 Northern Harriers can be seen in winter on all the loops of the Great Plains Trail. During winter, just at twilight, the short-eared owl launches itself from its daytime roost in thick prairie grasses to hunt rodents. This raptor (bird that hunts and eats other animals) visits Oklahoma in winters when rodent populations are high. As the owls start their evening hunt, they often call to each other with a call that sounds like, "keee-ow" and you will also hear a bark-like call (click on audio below). The owl has a bouncy flight just over the grasses where it listens and looks for its prey. As you drive along country roads, watch for these owls as they fly up from the ground alongside the road. 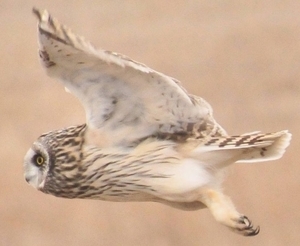 Short-eared owls will leave around the first of March to migrate north to their breeding range in the northern and northwest areas of United States and Canada. A good place to see short-eared owls in winter is at Hackberry Flat Wildlife Management Area on the Hackberry Flat Loop. The beautiful Mountain Bluebird visits western Oklahoma during the winter thanks to the abundance of sumac berries and Red-seeded Juniper and Eastern redcedar berries. The Mountain Bluebird can be found in Beaver River Wildlife Management Area in the High Plains Loop, Black Kettle National Grasslands in Chief Black Kettle Loop and Sandy Sanders Wildlife Management Are in Quartz Mountain Loop. This large member of the sparrow family is primarily a winter visitor in the western 3/4 of Oklahoma. It can be found on almost every loop of the Great Plains Trail but particularly in the Salt Plains Loop, the Quartz Mountain Loop and the Caddo Canyon Loop. More information can be found in the OK Dept. of Wildlife Conservation's website on the Field Guide Page. At one time the Bald Eagle was a familiar sight from coast to coast. However, our national bird suffered a dramatic decline caused by ingestion of pesticides and of lead-contaminated waterfowl. The Bald Eagle was listed in 1967 as an endangered species but due to conservation efforts on behalf of the Bald Eagle, it was removed from the Endangered Species List in 2007. Oklahoma is an important wintering area for Bald Eagles where, thanks to milder winter temperatures, open water provides plentiful food such as fish and waterfowl. 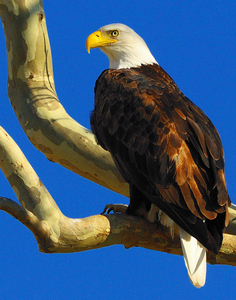 Many pairs of Bald Eagles now also nest in Oklahoma. Where to see Bald Eagles: Join OWPHA at the Eagle Watch at Quartz Mountain on Monday, January 8, 2018. Click here for Other Eagle Watches. 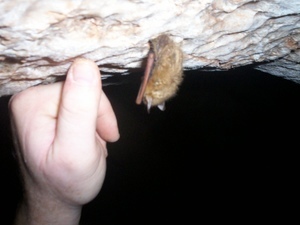 The Cave Myotis Bat weighs all of 1/2 ounce and has a 12" wingspan when fully grown. 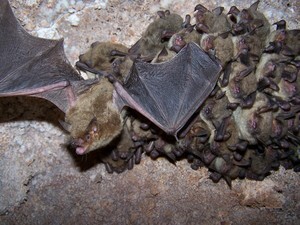 They are a very social bat, roosting in clusters of 250 bats or more per square foot. They feed upon a wide variety of insects depending upon which are available on any given night. They find their prey by using echolocation. They can live to be 12-15 years of age. The name correctly identifies the bat's preferred roost as a "cave" while the term "myotis" is a Greek word meaning "mouse-eared." Where to see a Cave Myotis: On the Bats and Bluffs Loop at Alabaster Caverns State Park year-round. The Tri-colored bats were formerly known as eastern pipistrelle bats. They are one of the smallest bats in North America with adults being no bigger than a human's thumb. The tri-colors are a solitary bat, preferring to stay by themselves. They go into hibernation much earlier than most bats. Because of this, they usually stay in very damp areas of caves, allowing water droplets to form on their fur, helping to keep them hydrated during the long winter. Most bats give live birth to one pup a year but tri-coloreds are known to give birth to twins from time to time. The Texas Horned Lizard's intimidating exterior is quite opposite from its docile and gentle nature. They spend their days eating ants, sunbathing and eluding predators. When threatened, their first reaction is to flatten out and freeze or to run briefly then stop, to create the illusion of disappearing. However, when extremely agitated, it will inflate its body, hiss, and even squirt blood from its eyes in order to deter predators. The Black-tailed Prairie Dog inhabits the short and mixed grass regions of Oklahoma. 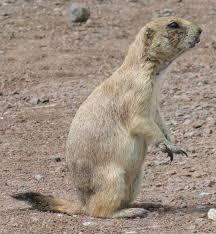 Prairie dogs are highly social animals that group together in colonies commonly called ?towns?. Prairie dog towns supply a number of other grassland species with suitable homes and are food for a number of others. Prairie Dogs are an integral component of grassland and prairie ecosystems, but their numbers and distributions have been reduced to about 2% of historic levels. Prairie dog eradication programs and conversion of native rangeland to cropland are the primary causes of this decline. The salt flats, at first glance, are not very hospitable places for this small bird to live. The standing water is too salty to drink, the wind blows hot and dry, there is very little vegetation for shade or shelter. So what does this shorebird do to survive? It does NOT drink the salty water; most of its water comes from the animals the bird eats: mostly insects (flies & beetles) and worms. It spends most of it?s time near the water where it is slightly cooler. When the bird gets really hot, it cools off by standing in the water! The Mountain Plover is a Great Plains native that breeds on the arid short grass prairie of Oklahoma. Prairie dogs create unique patches of habitat ideal for Mountain Plovers nesting sites. Currently their numbers are on the rise, and efforts are being made to protect breeding habitats, both inland and on the coast. The Least Tern is a small sea gull-like bird which breeds and nests primarily along rivers and salt flats. Many of these areas have been lost or altered by damming, dredging, and straightening of rivers. In addition, eggs and young chicks are vulnerable to predators, human disturbance, and the untimely release of water. The Least Tern finds safe havens in Northwest Oklahoma, but its habitat must be protected. The Whooping Crane stands nearly 5 feet tall and has a wing-span of more than 7 feet. It breeds in northern freshwater bogs and winters on coastal prairies. 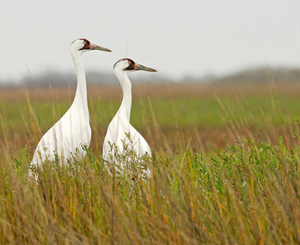 The Whooping Crane has been reduced due to habitat destruction from draining and clearing of wetlands, and human disturbance along its migration routes. While its population is on the upswing, the Whooping Crane remains on the endangered species list. In Oklahoma, Swift Fox prefer short to midgrass prairies. The Swift Fox use den sites year-round. It may excavate its own den or occupy abandoned dens or prairie dog bun rows. This species was once abundant throughout much of the North American prairie. Agricultural practices, as well as recent recurring drought, have reduced habitat and prey abundance. It is apparent that more intensive monitoring and management will be necessary to recover this species to a secure population level. The Arkansas River Shiner is typically found in turbid waters of broad, shallow, unshaded channels of creeks and small to large rivers. The Arkansas River Shiner has disappeared from most of the historic range over the past few decades due largely to human-caused alteration of natural stream-flow patterns and introduced fishes. This little vireo, with its restricted range, differs from most vireos in being rather nervous and active in its behavior. It is a tireless singer but is often difficult to find in the dense oak scrub. 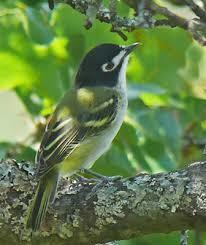 It has a titmouse-like habit of hanging upside down while foraging among twigs. In recent years this vireo has become rare, mainly because its nesting has been disrupted by cowbirds. These notorious nest parasites remove eggs from a vireo's nest and deposit their own eggs in their place. The young cowbirds are so much larger than the vireo?s young and they crowd and starve them out. Programs are underway in Texas and Oklahoma to prevent cowbird parasitism, by trapping the birds and removing their eggs from other birds' nests.